As with all species mentioned here in the past, there is a certain percent of error in the classification I give since many times I forget to write down names when I take pictures. 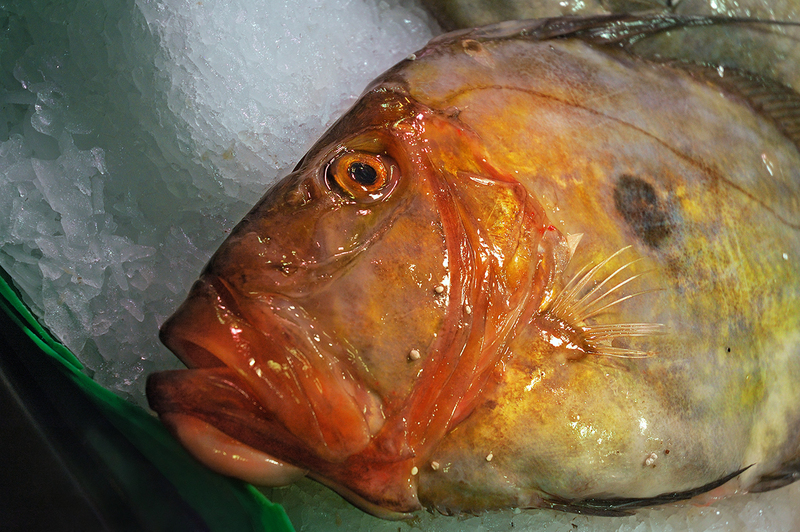 This one looks like a John Dory or Zeus Faber (Gallo, Ceo, Zeo or Pez de San Pedro in Spanish). The name Gallo (rooster) is also given to other species of fish in Spanish that are different in appearance and have different scientific names such as Lepidorhombus wiffiagonis aka Megrim. This is not an ichthyology treaty so just concentrate on the fresh appearance and the fact you can buy some at La Boqueria market in Barcelona or maybe other fish posted in Barcelona Photoblog recently. I like the composition, that you can see the ice too. The fish looks go gelatinous. Neat to see, we don't have much in the way of fresh fish around here. Wow - he sure is a colorful, slimy fellow! Carlos, you have actually made me smile. Great photograph! Love the text. I had trouble working out what Gallo was when I moved here. Gallo looks quite like St Peters fish or John Dory but apparently is it Megrim which I hadnt heard of before.